Photo One: The first place low gross was the Vermont Orthopaedic Clinic team. Pictured (l-r): Matt Howland; ATC Mike Dorion; Dan Cole, PA-C; Matt Gammons, M.D. ; and Jim Russell, M.D. Photo Two: The first place low net team was from BKD. Pictured (l-r): John Henry Hubert, Ernie Bove, M.D. ; Kevin Markowski; Bill “Bucko” O’Rourke, M.D. ; and Mike McCormack. 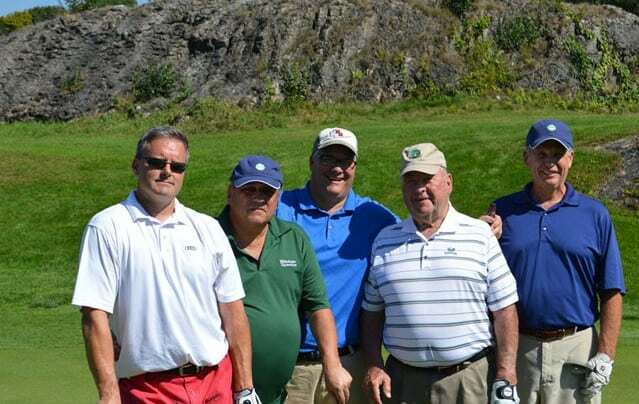 RUTLAND — The 22nd Annual Rutland Health Foundation Golf Invitational was held on Sept. 18 at the Rutland Country Club. Despite record-breaking temperatures, 26 teams teed-up to support programs of Rutland Regional Medical Center and the Rutland Area Visiting Nurse Association & Hospice. 2015 Tournament winners included first place low gross team from the Vermont Orthopaedic Clinic including: Dan Cole; Mike Dorion; Matt Gammons, M.D. ; Matt Howland, and Jim Russell, M.D. The first place low net team was from BKD and included: Ernie Bove, M.D. ; John Henry Hubert; Mike McCormack; Kevin Markowski and Bill “Bucko” O’Rourke, M.D. Men’s Longest Drive winner was John Zawistoski; Women’s Longest Drive winner was Ellen Miller. The Straightest Drive was accomplished by Bob Carrara; Closest to the Pin on second shots were Matt Gammons, M.D., and Brian Hill. And a Hole-in-One was accomplished on hole 15 by Randy Lague.